Shield Gules, an monstrance Or, flanked by two cinquefoils Argent. 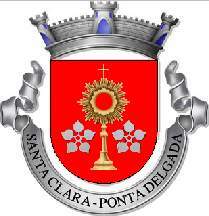 Mural crown Argent with three visible towers (village rank) , having blue gates, and grey scroll with inscription in black capitals "SANTA CLARA - PONTA DELGADA". The monstrance is an attribute of Santa Clara de Assis (1193-1243), which was presented to the Arabs, who sieged the Franciscan Convent of St. Damian, so that they flew. The cinquefoils had been the favourite flowers of Santa Clara, who used them for various purposes. The golden colour is representing vigour, the silver colour truth, and the red colour strength and valour. Santa Clara Commune is one of the 24 communes of Ponta Delgada Municipality; it had 2971 inhabitants in 2011 and covers 2.3 km². Santa Clara Commune was separated from São José commune in July 2002.